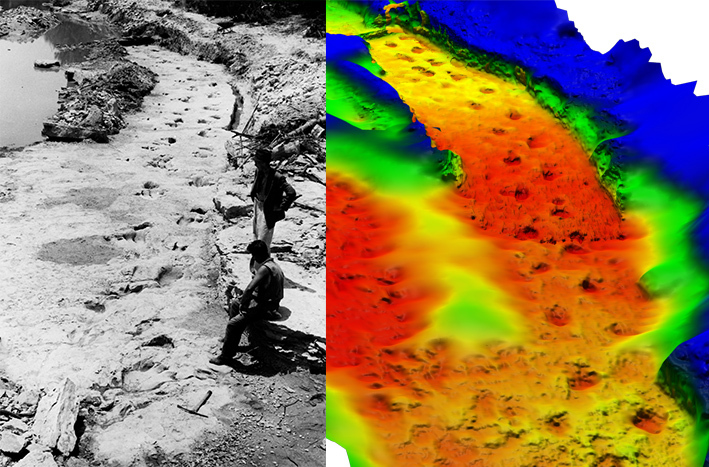 In 2014, colleagues and I published a photogrammetric reconstruction of the Paluxy River dinosaur ‘chase sequence,’ as generated from photographs taken before and during its excavation in 1940. (Blog post here). Photogrammetry has become pretty common now; commercial and open source programs are widely being used by all kinds of people, including palaeontologists, and there are some really exciting new technologies on the horizon. The model we produced last year was, well, it showed it could be done, but it wasn’t the highest fidelity model ever made. I look at the scanned in photos we have, and I’m sure that better can be done. So… I’m laying down an open competition (with no prize! ): Take the photos we used, and see if you can do better. Use whatever technology/software/magic you want, and see how good a model you can produce. I’ve made the photos available on figshare (link below), and all I ask is that any model produced is made freely available, and you let us know how you did it! You can either post your results in the comments, or email me directly and at some point in the future I’ll write up a round-up post of any successes. I’m excited by the idea of just having one big open collaboration of people, hopefully from palaeontologists, to amatuers, to computer vision experts, using the photos to see what they can do, and in the process advancing what can be done, and making methods more widely known. Best of luck, let’s see how people do. Download the photos and previous model here.